When Microsoft wanted to create a retail presence to compete with the likes of Apple, they knew it would need to stand apart. Microsoft and the Martin Agency turned to Digital Kitchen to concept and deliver content for the largest high-resolution store display ever created. Starting with a blank canvas, we conceptualized a series of thematic films that would speak to the customer directly. Each theme served as a full-motion narrative specifically designed to introduce Microsoft products, platforms, and services. We developed a modular design for the content allowing it to constantly evolve. Just as a DJ changes a mix depending on the vibe of the crowd, themes and footage can be mixed according to variables like time of day and who happens to be in the store. Further augmenting this mix, the dynamic functionality of the themes allows for the integration of Xbox gameplay and other realtime events. Beyond being a Creative Director for Digital Kitchen on production for all of the themes, I also directed the live action for the Entertainment theme. The subject of dancing was simply an amazing thing to shoot and it involved the most intense animatic I've ever made, since literally every shot had to be timed and placed to create a spatial experience for the store. The video wall circumnavigates the interior of the store and plays as a continuous moving image. The six films used a variety of filmmaking techniques from composited CG to live action panorama's shot with a massive camera array. 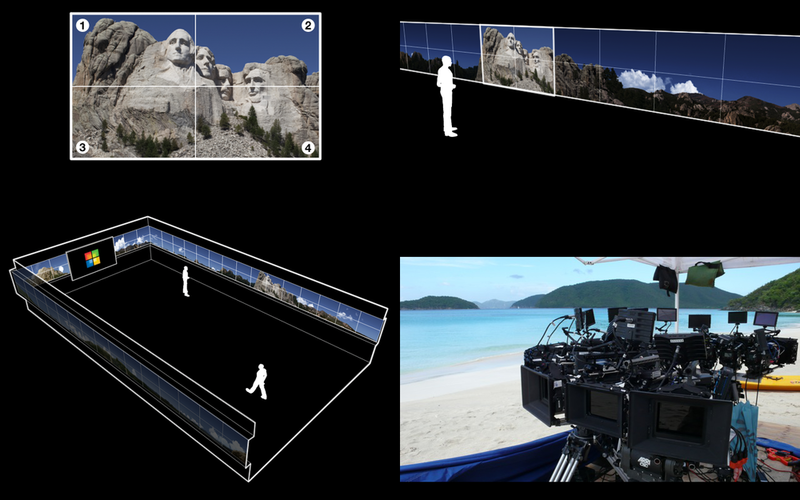 In order to achieve the seamless panoramic visuals of the ultra wide aspect ratio, we invented a system of 8 and 12 nodal arrays using Red cameras on location. The complete running time of all the themes is over 60 minutes. Ultimately, we rendered the equivalent of 6 million full-size HD frames. As a point of comparison, a typical feature length motion picture is approximately 180,000 frames. * These credits list senior roles only. The entire team was nearly 80 people comprised of dedicated artists, designers, animators and producers; each of whom greatly contributed to the completion and success of this project.